Line 2 large baking pans with parchment paper. Spread the chicken and onions evenly on one of the prepared pans. Drizzle with 2 Tbsp of oil and sprinkle with himalayan salt & pepper, covering both sides. Place in the oven and bake until chicken is cooked through. 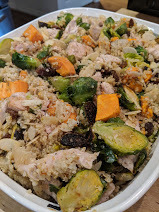 Place the sweet potatoes and brussels sprouts on the second pan. Sprinkle with thyme, salt & pepper. Place in the oven and bake until potatoes are soft and sprouts are golden brown. 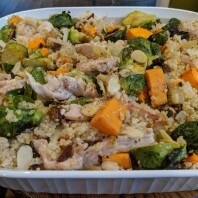 Place the cooked quinoa into a large casserole dish, top with cooked chicken, sweet potatoes and brussels sprouts. Pour the broth over the mixture and stir to blend the ingredients. Stir in raisins and almonds.